South Africa is mostly an arid country, except for Natal and the southern Cape coastal plain. There are few large rivers suitable for swimming events as these are mostly dammed up and unreliable as swimming venues, although there is a growing number of suitable dams. Despite these limitations the British arranged swimming, diving and water polo competitions in any suitable body of water. The Seal Swimming club in Pietermaritzburg started a Mile race in the nearby Midmar Dam in the 1970's, and today it is the largest open water swimming race in the world. Many races are are now held in dams, which feed into the FINA Olympic 10 km event, and help to raise funds for local clubs. The earliest record of river swimming is from the dairies of 18th century travellers, who record the Hottentots swimming across the Orange river with the help of a log. H. Wikar (1778) describes the Hottentot way of crossing rivers simply by swimming grasping a log, or by a raft propelled by several swimmers. Moffat records that these swimming logs were about six feet long, four to six inches in diameter and made of dry willow. When used to transport a load, several were tied together with strips from the inner bark of the mimosa to form a temporary raft. Denys Reitz says that the swimming logs were handed down for generations and that a European who ignorantly tried to chop one up for firewood was "half murdered" before he was rescued! Few rivers in South Africa are known to have played much of a role in the history of aquatic sports. The rivers were obstacles to be crossed by early inhabitants and Voortrekkers, and no doubt also for recreation - known today as 'wild swimming'. The Zwartkops river outside Port Elizabeth was used for the 5 mile Enduro swim, and by the Redhouse swimming club for their annual mile race since 1924, although the race was moved to the Sundays river in 2010 due to pollution. The Buffalo river mile in East London was swum during the 1950's, and the Vaal river was used in the Transvaal for some of their mile races, while long distance swimmers have swum the length of the Orange River. The dams that have played a role in the aquatic sports history of southern Africa include the Midmar Dam in Natal, Hartbeespoort Dam, Germiston Lake and the Kariba Dam in Rhodesia where an open water race was held annually during the 1960's. Today races are held in many dams across South Africa - Sun City, Clanwilliam, Maselspoort, Ebenzer and many more. In Zimbabwe the first Troutbeck Mile was won by international superstar Kirsty Coventry. Swaziland has their annual Open water race in the Lupholo dam. Click here to see the Open Water Schedule for 2017. In the south of the Transvaal, the Vaalrivier and the Vaal dam both have a long history of recreational and competitive water sports - yachting, canoeing and swimming, although little evidence of those events have been located. To the west of Johannesburg lies (or did lie) Homestead Dam in Randgate, where the Randfontein Swimming and Boating Club hosted the Transvaal Championships 220 yards Freestyle event - on 20 March 1921! Homestead was the name of randlord JB Robinson's house in Randfontein. No photos of this lake can be found, but there is another Homestead dam, built in 1896, near Benoni in the east rand, where the Gauteng Open Water Challenge are to held in 2018. No trace can be found of the Randfontein Swimming and Boating Club of 1921 vintage. Victoria Lake in Germiston was created in the late 1800's to provide water for a power station. The Germiston Aquatic Club was founded there in 1906, which later became the Victoria Lake Yacht club. Germiston High School is located on the southern shore of the lake. Mecedes Gleitz swam there in 1932, and today it is used for open water races. Home of the Roode 1000 since 1997, this is the premier open water event in the Northern Transvaal. In 2002 the British Open Water team swam in the event, winning alll the podium positions! Chad Ho and the late Kenneth Smith racing to the finish in 2008. Near Muldersdrift in the Western Transvaal, the hand-made Franz Richter dam wall is the largest hand-built stone dam on the African continent. The annual Lake Heritage Water Festival is held here. It is said to have the cleanest water in the Transvaal, so it is frequently used by paddlers, canoeists, fly fisherman and open-water swimmers for multiple swimming events including the Rockman Ultra Triathlon and the Midmar Mile qualification rounds. The first Ebenezer Mile Swim was held in 1992. The dam, built in 1959, is located east of Pietersburg in the Wolkberg. The Sun City Mile was started in 1998, and has been won by swimming stars like Natalie du Toit, Chad Ho and Terrance Parkin. Near the Northern Transvaal town of Warmbad, the Bosveld Myl was inaugerated in 1998, with 20 swimmers. The Van Ryn Dam in Benoni is one of the many lakes of the eastern Transvaal, and it is where the Rynfield Mile race is swum. Home to the Platinum Mile since 200 is the Buffelspoort Dam. The venue for the annual Midmar Mile event is located in the Natal midlands outside Pietermaritzburg. Boating, swimming, waterskiing, picnicing, and fishing are popular pastimes at Midmar Dam. Each year, the Midmar Mile swimming race is held there, which organizers call "the world's largest open water swimming event". Over 20,000 entries were received for the 2009 event. The dam's primary purpose is to serve for municipal and industrial use and its hazard potential has been ranked high. The Chelmsford 1000 Challenge is held at the Chelmsford Dam, south of Newcastle. Historically dam swimming was uncommon in the western Cape, as the oceans were readily available, although recently several open water races have been inaugurated, in places like the Clanwilliam and Brandvlei dams. There are a number dams on Table Mountain, like the Motleno dam built in 1877, used to regulate the water supply to the city. On the Cape Flats next to Table Mountain are a number of wetland lakes like Zeekoeivlei, while a number of catchment dams have been built in the mountains further away. The Molteno Dam sits right above the Cape Town city basin. Click here to see more images. Below Table Mountain lies the Cape Flats - an area of sand dunes and wetlands. The wetlands include Zandvlei, Zeekoeivlei, Princessvlei and Rondevlei. Click here to read more them. On the Atlantic coast near Milnerton lies the Rietvlei, fed by the Dieprivier. Zeekoevlei was not always that easy to get to. In the early 1900s it took a serious walk along the beach from Muizenberg, and then a trek through the dunes. Keen sailors dragged their boats all the way, some using donkeys and horses. Below is Zeekoeivlei in the early days - note the beach, and bathers walking along Muizenberg beach to get there on foot. The vlei was used for rowing since 1964, and the Zeekoevlei yacht club was started in 1932. At Zandvlei near Muizenberg the Imperial Yacht club was also started in 1906. Near Cape Town is the village of Grabouw, which hosts the Sanlam Cape Mile in the Eikenhof dam since 2015, and outside Franschoek is the Val de Vie Estate where the Bridgehouse School Annual Mile is swum. In the Cederberg 230 km's north of Cape Town is the Clanwilliam - home of rooibos tea - and the the Annual Freshpack Fitness festival, with its 1,5 and 3km swim races. Springbok Backstroker Simon Thirsk won the veterans 1,5km event in 2017. Click here to see a beautiful set of photos from that event. A number of local events are held in salt water, as well as the 1927 Redhouse River Mile race - the oldest in the country. The only dam race in the eastern Cape uses the Wriggleswade Dam near Stutterheim, where the annual Merriefield Mile has taken place since 2002. It is being touted as the highest mile-long open water swim in the world. Set among the jagged peaks of the South Drakensberg, the water temperature of the 2 554-metre-high Loch Ness Dam at Rhodes in the Eastern Cape Highlands rarely rises above 18°C in summer. Maselspoort is situated on the banks of the banks of the Modder rivier, NE of Bloemfontein. 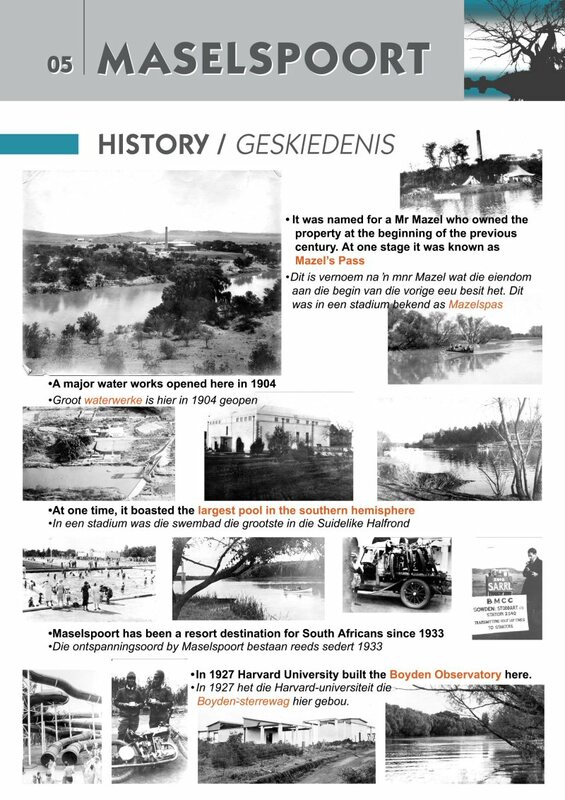 In 1904 a major water treatment plant was opened at Maselspoort which had a capacity of over 220 million gallons. It once boasted the lagest swimming pool in the southern hemisphere at the resort which opened in 1933. In 1934 the then Prince George of England visited Bloemfontein and was wined and dined at Maselspoort. Today the resort is in decline, but the dam is used by Kovie Aquatics for an annual mile race. The Sterkfontein Dam in the eastern free State hosts the annual Sterkfontein 1500 and 3000 races, since 2001. Long before the swimmers retreated to the safety of crocodile-free Troutbeck dam, the Rhodesians swam races across the croc-infested Kariba dam. Joe Hillstrom, who swam across the Kariba dam in 1968, also won the first Redcliffe Island to the Cutty Sark and then his brother Norman Hillstrom won it three years in a row. Rhodesian divers used the Kyle dam wall as diving platform. The dam wall supports can been in the bottom photo. The Zimbabwe Open Water championships are held at the Troutbeck resort. The Swaziland National Swimming Association hosts the annual open water race at the Lupholo dam, south of the capital Mbabane. The manne from the resort town of Redhouse, on the banks of the Zwartkops river - in 1895. In 1958 Karin Pretorius of Northern Transvaal won the South African half-mile event in the Vaalrivier, as well as winning the Buffalo River half mile.